Good evening. I would like to extend a very warm welcome to this, the second seminar in the ‘Working in Public’ series. I would particularly like to welcome back Suzanne Lacy. Tom Trevor, Director of Arnolfini in Bristol, will deliver the guest lecture tonight. I would also like to thank Francis McKee and the CCA for hosting this event. Working in Public is developed by the On the Edge Research at Gray’s School of Art in partnership with the emergent Public Art Resource+Research, Scotland (PAR+RS). The series and the resource are funded by the Scottish Arts Council. The goal is to evolve a piece of new thinking in relationship to how artists are currently working in the public sphere and, in particular, to grapple with the issue of what quality means when artists work in relationship to other sectors of society. 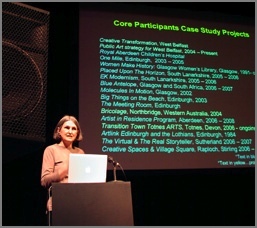 PAR+RS is a new initiative by the Scottish Arts Council to support this area of work. A third dimension of this work takes advantage of Suzanne Lacy’s presence at Gray’s School of Art developing her own research in terms of mining a very important period of work: ten years of working in the area of Oakland between 1990 and 2000. In response to these complex agendas, we have attempted to develop a new kind of learning space. Individuals who are currently working in the field in public art come together with ourselves in academic research and with Suzanne’s very important work in Oakland to begin to develop the new thinking. At the core of the whole series is a group of artists, educators and arts administrators who have gone through a formal selection process. They have offered their own experience of the field of practice to the programme. They are Kerstin Mey, Sally Thomson, Kate Gray, Adele Patrick, Ruth Barker, Keith Donnelly, Kate Foster, Jean Cameron, Damian Killeen, Janice Parker, Sarah Munro, Monika Vykoukal, Janey Hunt, Jan-Bert van den Berg (who is going to be here tomorrow), Roxana Meechan, Venda Louise Pollock, and Taina Erävaara (who is actually in Finland and we are working with her remotely). They are a very interesting and important group of people that offer a wealth and diversity of experience to the space. The projects they bring with them are predominantly Scotland based, but also from further afield. If you want to know more, their profiles are on the Working in Public website. In our first seminar we followed a similar pattern to these next two days: we had a guest lecture in the evening delivered by Grant Kester and Tom will deliver that lecture tonight. This was preceded by a very short introduction by Suzanne of the Oakland Projects, and that is followed by a question and answer session that, tonight, Francis (McKee) is going to lead. The next morning we held a seminar in which Suzanne gave us an outline of one of the projects within the Oakland series. That was followed by a dialogue between Grant Kester and Suzanne. We are aiming to do that again tomorrow between Tom Trevor and Suzanne. Again this will be followed by a question and answer session. The final session tomorrow afternoon is the studio session where the core group come together and the dynamic is reversed. They bring their experience of practice and they mine that practice through their own projects, obviously taking into account the earlier discussions. The whole programme consists of four themes. These themes were originally identified as being very important to the Oakland experience, but they also resonate with our own experience of working in public. The first one was Aesthetics and Ethics in which Grant gave us a way of thinking about aesthetics in art that is closely connected with ethics. Today we are dealing with Representation and Power and, in three weeks’ time in Inverness, we will be dealing with Quality and Imperfection. The final event, which is a public dissemination event, will be dealing with Cultural Rights and Entitlement. That is likely to be, probably, the 24th of September. I would like to hand over to Francis now and, thank you, Francis, for hosting Seminar 2.